In less than one week, after all the tryptophan has worn off, lawmakers will be back in Raleigh working on a measure that will require North Carolina voters to have a photo identification to cast a ballot. Residents voted on an amendment to enshrine such a requirement in the state constitution. Thirty-four states have some form of a voter ID law varying in levels of “strictness,” but most do not require it in their state constitution. North Carolina legislators vowed to return for the lame duck session next week to implement the new amendment. GOP legislative leaders released a copy of their draft Tuesday evening. Acceptable forms of ID that are valid and unexpired would include a state drivers license or DMV identification card, a U.S. passport, a tribal enrollment card issued by a federally or state recognized tribe, a student ID issued by the University of North Carolina school system and a drivers license or photo ID issued by another state if the voter’s registration was within 90 days of the election. The following photo IDs can be used regardless of expiration or issuance dates: a military ID issued by the U.S. government; a veteran’s identification card issued by the U.S. Department of Veterans Affairs; any of the allowed IDs, even if they’re expired, if the voter is at least 70 years old, as long as the ID was unexpired on their 70th birthday. The Joint Legislative Elections Oversight Committee is scheduled to meet at 10 a.m. Monday in room 544 of the Legislative Office Building. It will be open to the public and audio will be available online at https://www.ncleg.net/. Rep. David Lewis (R-Harnett) tweeted a copy of the agenda for the meeting, which includes a staff presentation on the draft legislation and presentations from state independent colleges and universities and community colleges. State Board of Elections and Ethics Enforcement Director Kim Strach is also scheduled to present. It is not expected that the committee will take votes ahead of the legislative session, which begins Tuesday. It does not appear that there will be an opportunity for the public to provide input at the Monday meeting. Voters should be allowed to use a broad range of IDs – We know at least 1,400 people were denied their right to vote under the 2013 voter suppression law because they didn’t have the “right” ID, and those they did have, like student IDs and trucking licenses, weren’t accepted. The Fourth Circuit also found that the law targeted African Americans with “almost surgical precision” by not allowing IDs disproportionately used by Black voters but allowing forms of IDs disproportionately used by white voters. Voters should be able to obtain a free ID if they need one – Obtaining an ID can be costly, and poll taxes are unconstitutional. 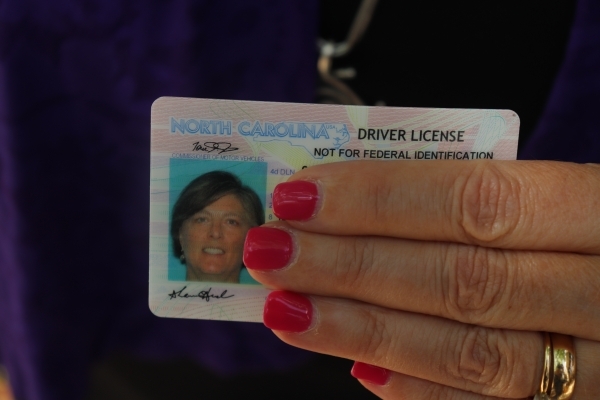 We know more than 200,000 North Carolinians lack a DMV-issued photo ID. Voters should be granted exceptions in reasonable circumstances – As Colin Campbell pointed out yesterday, no one’s right to vote should be denied just because they lost their wallet, to give just one example. Indeed, U.S. Senator Richard Burr had to cast a provisional ballot in 2016 because he had lost his ID. Other impediments to getting an ID should be accommodated as well. 317,000 registered voters do not have government issued ID’s; these North Carolinians would have to obtain an acceptable ID – which is not yet determined – before they could vote in the next election. It essentially disenfranchises folks who were already eligible to vote. Voter ID laws disproportionately impact low income communities, the elderly, the disabled, women and veterans – these populations are more likely to lack acceptable ID’s and many lack the resources to obtain them – particularly those in rural areas for whom going to the DMV is difficult. If NCDMV’s will be the primary outlet for obtaining ID’s – which is not yet known – there is some concern about their level of resource to do this adequately. There is no real reason to do this – there is very little evidence of in-person voter fraud (less than 1 percent) and it will inhibit some people from voting; in our view we should make the voting process easier not harder. The League would love to see the state implement online voter registration, [funding] to update voting machines in the counties that need them, consistent early voting periods, etc. Let’s make it easier to vote – we can do better than 52 percent of registered voters casting a vote (and this was record breaking turn out for a midterm election). Free ID’s for all eligible voters, with no additional fees. Information in multiple languages to reflect the current and emerging diversity of North Carolina’s voting base. Arranged transportation upon request for individuals who do not have the luxury of mobility and will be otherwise disenfranchised. Of course Common Cause has long opposed photo voter ID – no justification in making voting harder. We also feel like as this discussion takes place and decisions are made, this lame duck legislature has no business in being involved. This is the legislature that passed the voter ID bill in 2013 that was found [to be] discriminatory. This is the legislature that shuts out public debate and input from the other side. So, our feeling is it’s wrong for this legislature to be adopting anything to do with Voter ID. Allow for as many ID’s as possible, including: student ID’s; any government issued ID – which can include out of state driver’s licenses; a valid bank card of valid debit card; a valid utility bill issued within six months of the election; a valid bank statement issued within six months of the date of the election; a valid health insurance card issued to the voter. The other needed item is an exception for those who do not have a photo voter ID. If you don’t have an ID but you are properly registered, [you can] sign an attestation that you are attesting under the penalty of perjury that you are who you say you are, and you get a full ballot, not provisional. I’m not holding my breath that the lame duck legislature will look favorably on ideas that will lessen the burdens of having a voter ID law. No one wants fraud. But no one would be comfortable with any law that may disenfranchise voters. Every state is different and needs to take into account its own needs for voter ID. The organization gave some key points for consideration, noting that it was not an exhaustive list. Include an exception for anyone for whom obtaining an ID would be unduly burdensome. Make sure that the list of acceptable photo IDs is expansive; one that includes a wide variety of IDs (that means not limiting the list to government-issued IDs and including as acceptable student IDs and employee IDs). Provide alternative options for voters who are unable to present IDs. In some states, voters who don’t have an ID can sign an affidavit about why they don’t have an ID and attest to their identity, and they can still cast a regular ballot. There are some administrative provisions that can also help, including having a reasonable budget for making free photo IDs available to those who need it (or some sort of free election ID for people who can’t obtain other forms of ID) and making sure poll workers and election officials are trained well to administer elections fairly and properly. At a minimum, the legislature should provide for a wider range of documents that can be used as voter ID, not a narrow list confined to, for example, driver’s license, passport, or military ID. It is disproportionately difficult and expensive for transgender North Carolinians to obtain a driver’s license or passport consistent with their gender identity. Given the Trump Administration’s stated intent to ban transgender people from the military, using a military ID does not work as an alternative to driver’s license or passport. The range of acceptable photo ID documents should include a free identification card that does not contain a gender marker, with a wide variety of documents acceptable as authentication of the holder’s identity. The North Carolina General Assembly should appropriate funding to ensure that these voter IDs are free and that voters can obtain them at least as easily as completing the process for voter registration. The legislature should abandon any legislative proposals seeking to preempt municipalities from creating alternative forms of identification, such as faith IDs that immigrant communities rely on and which make encounters with law enforcement safer. Voter ID has historically been and continues to be a tool of disenfranchisement particularly for communities of color, immigrants and people of lower income. Within the scope of current legislation, NCAAT advocates for as broad of a list as possible for acceptable IDs and for a process to acquire IDs that is accessible, expedited and transparent and free to the voter. Broad list for acceptable IDs – Legislators should consider expanding to include IDs such as those from private schools, community colleges and state and local government agencies. Accessibility – Legislators should take into account accessibility issues in regards to obtaining any type of ID. Time and distance – Legislators should consider making any new IDs accessible for longer periods of time and in wider areas. DMV offices in some counties have very limited hours and are far from residential areas. Long wait times may not be reasonable for people with jobs. Efforts should made or be mandated to have ID drives outside of working hours where community members live, for eligible voters who may have limited time or mobility. Expedited – Any process for obtaining an ID for the purpose of voting should be expedited or immediate. In the 21st century, there should be no excuse for not investing in an infrastructure that can provide eligible voters with an immediate available ID. Voters should not have to wait weeks or even days for an ID to be available to them. Transparent and free – Many of the current list of acceptable IDs in the legislative bill also carry hidden costs and hurdles such as access to a birth certificate. Any new IDs that legislators make available for voters without other forms of IDs should be obtainable through a process that is transparent. It should be the government’s responsibility to ensure that its citizens have free access to the requirements for such IDs and that any potential hidden costs and hurdles eliminated. Legislators should also listen to their constituents and do diligent research on populations that will be affected before implementation. A transparent public comment period, for example, will be helpful to craft and adjust legislation regarding what would best serve the most impacted parts of our community.